Who avoids the most tax and what does that mean for inequality? These were the questions asked by two National Bureau of Economic Research working papers submitted this month (Tax Evasion and Inequality and Who Owns the Wealth in Tax Havens?). Both papers are available publicly here. The research was based on a variety of data, including ICIJ’s Swiss Leaks and Panama Papers investigations, and prove for interesting reading. Here are seven highlights from the reports. The ultra-rich, people whose net worth is more than $45 million, are ten times more likely to evade taxes than the average citizen, according to the research. That means the ultra-rich have worked out how to avoid paying about 30 percent of their personal income and wealth taxes. And it probably doesn’t stop there, with the authors suggesting that “evasion among the wealthy may be even higher” because their research was based on Scandinavian countries where social trust is high, corruption low and respect for the rule of law strong. 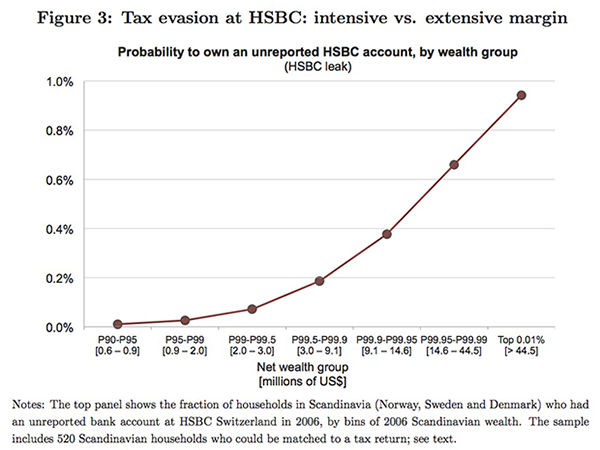 The likelihood of Scandinavians in the bottom 99 per cent of wealth share hiding their assets in HSBC accounts was “negligible,” according to research based on ICIJ’s Swiss Leaks. But the probability rises to 1 percent among the richest 0.01 percent. “The gradient is notable too: top 0.01 percent households are 13 times more likely to hide assets at HSBC than households in the bottom half of the top 1 percent,” they wrote. The use of offshore accounts “steeply rises with wealth,” according to research based on ICIJ’s Panama Papers. 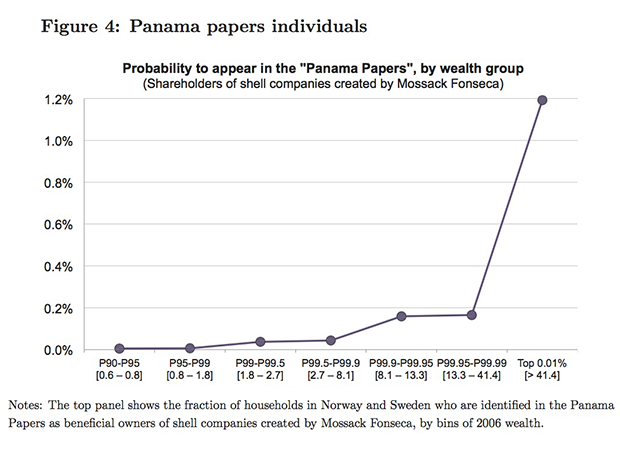 This charts shows the probability of owning a Mossack Fonseca offshore shell company significantly increased for the top 0.01 percent of Norway and Sweden’s population. “The use of tax havens appears more concentrated in the Panama Papers than in the HSBC leak,” the authors wrote. The researchers also suggested one reason very few households outside the 0.01 percent in the Panama Papers used shell companies to conceal wealth is because it is a “more sophisticated” strategy than owning offshore bank accounts. 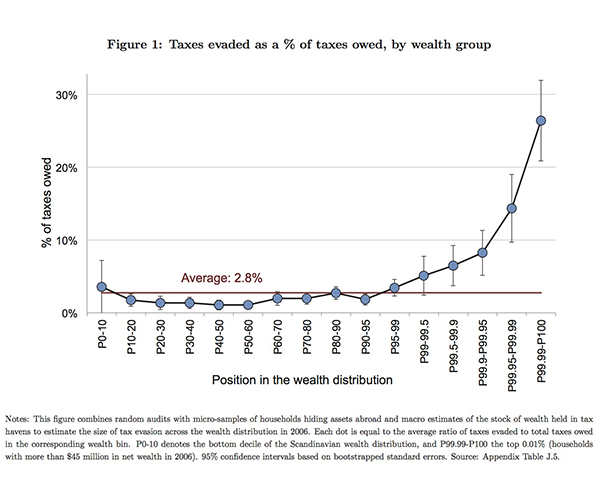 In the second study, the authors analyzed the global amount of wealth in tax havens. For example, Russia (60 percent), Europe (15 percent) and other nations hold a significant chunk of their GDP offshore, whereas Scandinavian countries own just a few percent of GDP. The research found the size of this wealth was “not easily explained by tax or institutional factors” but instead correlated more closely with a country’s proximity to Switzerland, the presence of natural resources and political/economic instability. 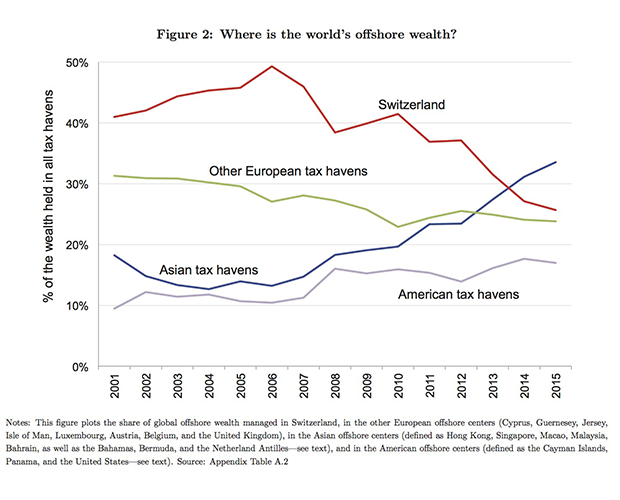 However, the times might be changing, with the research also discovering wealth was growing in tax havens based in Asia – and mainly in Hong Kong – with offshore accounts held in Switzerland declining since the 2008 financial crisis. The authors predicted offshore assets in Hong Kong have grown six-fold between 2007 and 2015 with the country now ranked second behind Switzerland for tax havens. 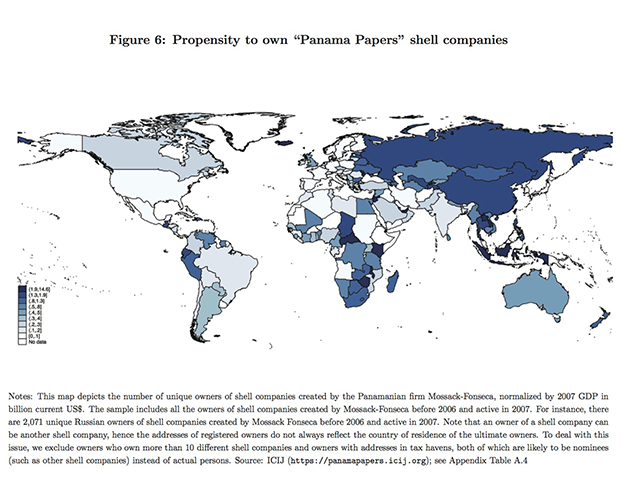 The next chart shows the number of unique owners of shell companies created by Mossack Fonseca in each country before 2006 and active in 2007, using Panama Papers data. “There are strong similarities between the amount of offshore wealth we estimate and the use of tax havens as revealed by the Panama Papers,” the authors said. Russia is one such country with a total of 2071 unique shells. The authors also highlighted that China is over-represented in the data given estimates of how much Chinese wealth is offshore. They suggest this could be because estimates of China’s offshore wealth are low, or that Chinese use shell companies for purposes other than concealing wealth. So what does that all mean for equality? 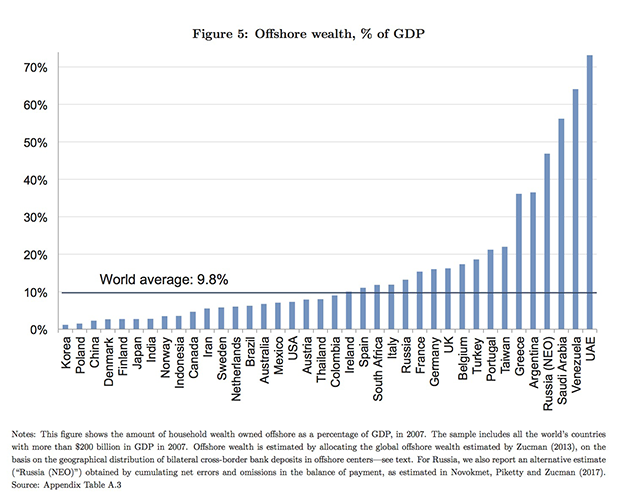 Including offshore assets generally increased the 0.01 percent’s wealth share substantially (even in the law abiding Scandinavian countries). 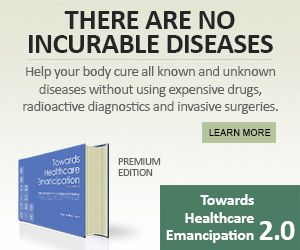 The effect in some countries is much worse than others. 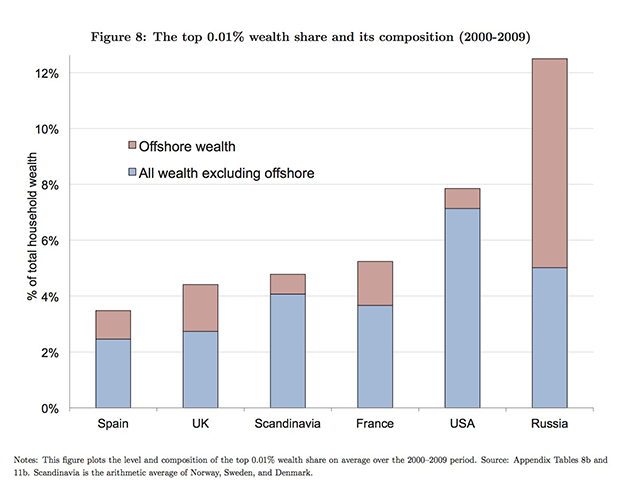 In the United Kingdom, Spain and France offshores assets accounted for between 30 to 40 percent of the 0.01 percent’s wealth. In Scandinavia, however, their share of wealth only increases by about 1 percent. No one outside the “inner circle”, is aware of the actual wealth, either cash or assets, of the so-called Super-rich. Let’s be honest, most of the elite top one percent, own much of the world’s former nations, so intellectualizing data and arguments against tax havens, are futile. 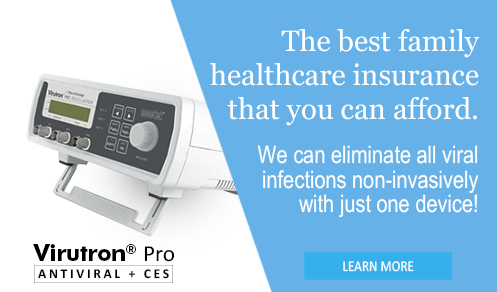 A more prudent tactic, would be forming a “system within the system” operation. Then, ordinary people could trade/barter with eath other. I have my Simplenote app and fukc load of references and footnotes just for you. Maybe i missed something, but everyone including this website promotes china and the asian econmies as being the economic saviors and the ‘moral compass’ of the world yet admits they engage in the same underhanded tactics as everybody else. I dont recall communists ever using these tax evading tatics? 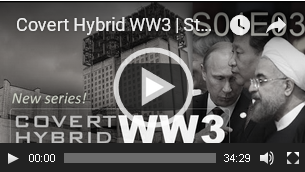 So how anyone can claim china is communist is very odd. Money and capitalism go hand in hand. Capitalism is capitalism. And china is the worlds biggest economy. 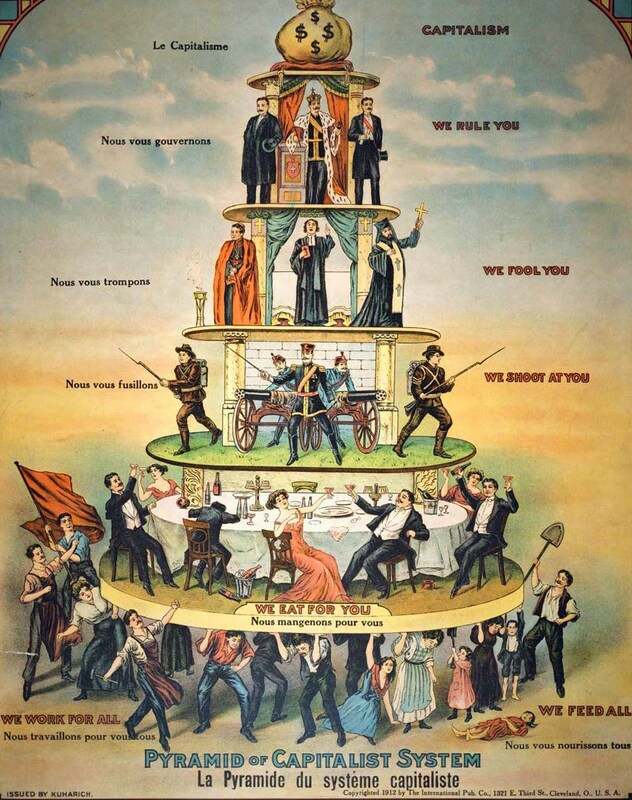 The above pyramid of power could be communism as well just change the word Capitalism for Communism and change to dress code. The only real wealth is real estate ,or land ownershipThe Vatican some say is the wealthiest I think its the Crown of Crown Lands Others say iuts secretly the Queen.The royals of the past never even bothered with cash at all .They had gold and land and human stock as well as natural resources like trees ,water,diamonds coal etcetera They only used ” cash ” to give kaboiur some tool to exchange with.